Pomegranate is low maintenance plant which often grows in the wild better than in some gardens. 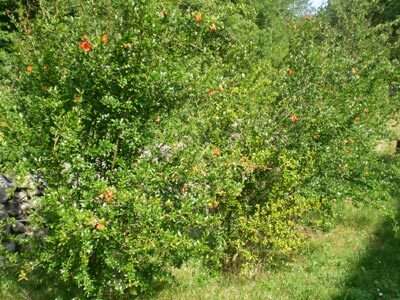 Pomegranate trees (Punica Granatum) are perennial, deciduous, woody plants that more closely resemble shrubs than trees. 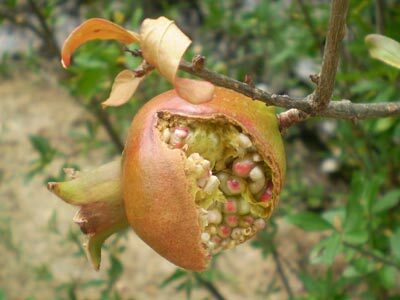 They can be grown as a shrub by leaving suckers (grown from roots and crown) or as a tree by removing suckers and forming the pomegranate plant into the tree. As a small tree, it can grow 6 to 10m (20 - 33 feet) high. The pomegranate plant has thorny branches and is extremely long-lived. Pomegranate trees are somewhat tolerant on moderate frost, down to about −12 °C (10 °F), especially when protected from direct cold wind. It grows best when planted in well-drained soil of any type on sunny locations. Pomegranate is not very picky about soil's pH - it can grow in soils ranging from acid loam to alkaline soils, however, most gardeners keep slightly acidic soil and achieve great results. 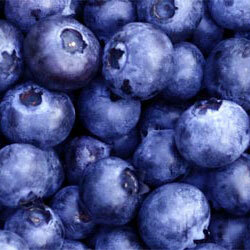 It is also rather drought tolerant, however, water levels should be kept constant in order to prevent fruit damage. Pomegranate is a berry, with fruits being 5–15 cm (2-6 inches) in diameter, rounded in shape, with thick, red-brownish skin. 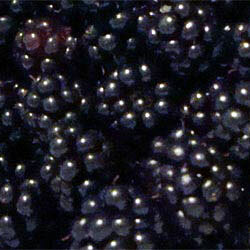 The number of seeds can vary from 200 to about 1400 seeds. It is native to southeastern Europe and Asia and has been cultivated in ancient Egypt, Persia, India, Babylonia, Iran etc. Plant is very ornamental, especially when flowering and some people grow them for their flowers and fruits are just a 'byproduct', loaded with vitamin C and other vitamins, minerals and antioxidants. Also, some varieties are grown only for their flowers. Pomegranate can be propagated from the seeds, from the cuttings and from air layering. When grown from the seeds, genetic variations can occur with unpredictable results. Sometimes, this leads to more resilient plants and sometimes to growing pomegranate plants with barely edible fruits. Genetic variations can be avoided using cuttings to propagate and grow pomegranate plants. Growing pomegranate from cuttings is very simple. 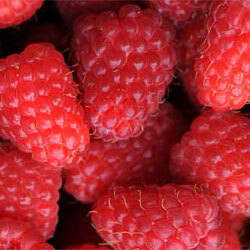 The cuttings should be approximately 35-40cm (12 - 16 inches) long. Cut the branches and dip the cut end of the branch into the rooting hormone to help it grow and plant them into the soil, or even better, in larger flower pot, filled with good potting soil that drains well. Best period for planting cuttings is in February and March when the pomegranate plant is still dormant. Air layering is similar to growing from cuttings, except that rooting itself is done while branch is still connected to the mother-tree. Choose the branch and remove some bark from the branch (slight 'damage' is more than enough) and dust it with rooting hormone. 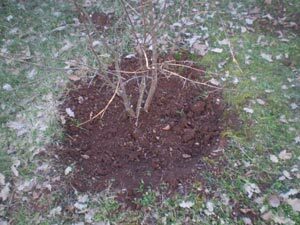 Wrap nylon bag around the chosen branch and fill it with moisture retaining soil. With time, branch will grow roots into the nylon bag. Best period for air layering is in the late winter or early spring, with new, young plants being ready for planting on permanent position in the autumn or even sooner - this depends on location, variety, grow strength etc. 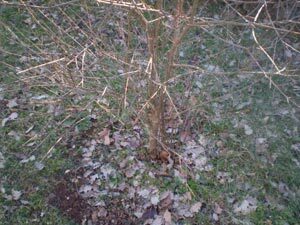 Some gardeners prefer to cut rooted branches in late winter and early spring, but this can lead to roots damage by the frost, during the winter. However, if you need only few plants, perhaps it is the best practice to buy certified pomegranate plants from a local nursery. Such plants are not small and they often come in 10-20l (2.5 to 5 gallons) containers. The flowers of the pomegranate plants are self-pollinating, but, fertility can be improved through cross pollination. Pomegranate trees will yield fruit approximately three years after planting. Note that young plants may drop flowers and fruits, while more mature plants hold flowers and fruits better - flower and fruits drop is aggravated by over-fertilization, excess watering and soggy soil in general. Pomegranate is low maintenance tree, requiring almost no care. Pruning - pruning of pomegranate plant depends on growth type. As said before, when grown as a bush, branches growing from the soil (from crown or roots) are usually left to grow normally. When grown as a tree, such suckers are removed. General rule of thumb about pruning is to remove everything that is ill, damaged or dead and let everything else to grow. If the plant is too 'thick', thin it according to your needs and preferences. 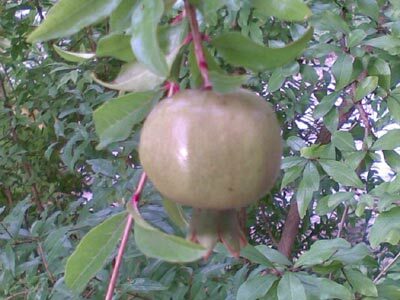 If the pomegranate is grown in the container, pruning must be little bit more aggressive, since it should keep the plant within certain size limits. 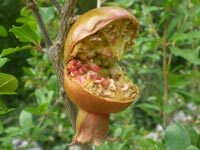 Diseases and pests - pomegranate are resilient plants, however, aphids, the pomegranate butterfly (Virachola Isocrates) and the leaf-footed bug (Leptoglossus Zonatus) can make some serious damage and make fruits inedible. Watering - pomegranate plants are resilient to droughts, but they grow better when soil is somewhat moist. Too much water is not good for pomegranate and can cause serious issues like flower and fruit drop and can even kill the plants. Depending on growing conditions (day and night temperature, soil quality, size and age of the plants etc), pomegranate should be watered every 7-8 days. In periods of high temperature, it should be watered more often. Amount of water per single watering should be around 2-3cm (around 1 inch) - that is around 20-30 liters per square meter. 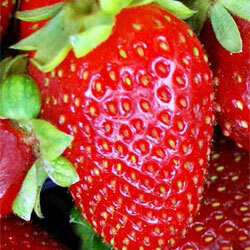 To prevent fruit damage, don't water suddenly with too much water - it is better to water with less water, more often. If you live in arid area, consider dripping system even for the pomegranate plants. Fertilization - an adequate level of nitrogen (N) and potassium (K) is required for vegetative growth, flowering and fruit yield. Pomegranates require nitrogen and potassium in approximately 1:1 ratio. For high pH and heavy producing trees, a ratio of 1:1.25 is recommended. So, when fertilizing pomegranate trees, use balanced fertilizers like 8-8-8 and similar, around 0.5kg per 1m of plants height, twice per year (March and July). Also, adding some compost, humus and dried manure can increase macro and micro nutrients levels, but it can also improve soil itself. One of the symptoms of overfertilization is strong, vigorous growth, but without fruits - in such cases, reduce fertilization. Personally, late winter is the most important period for pomegranate plant care. Regardless if you are growing pomegranate as decorative plant, or as fence or for fruits (or combined), in late winter, pomegranate trees are still dormant. First thing to do is to clean the soil from weeds, dried leaves and other debris as much as possible. Also, prune everything that looks dead, damaged or simply shouldn't be where it is. After cleaning, add some dried manure and balanced NPK fertilizer. Amounts depend on the size and age of the plant. Also, I prefer to re-feed the plants more than twice per year (using less fertilizers) - this keeps nutrient levels more constant and avoids spikes in nutrient levels, especially when organic fertilizers are used (they release nutrients more gradually). Pomegranates on the picture are obviously grown as shrubs and as decorative fence toward (very) old stone wall (creating strong contrast during vegetation period). 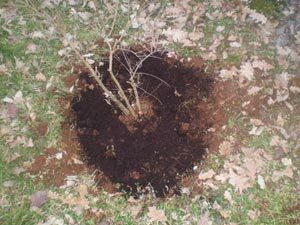 Dig in the manure and NPK fertilizer into the soil and as you dig, continue to remove old leaves, weeds and especially weeds' roots. 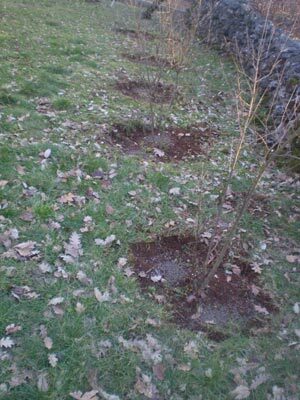 Obviously, it is possible to have lawn and pomegranate trees (and fruit trees in general) on the same soil patch, with proper care and some extra work. Add some compost or humus on top of the soil and dig again. Of course, compost, humus, NPK fertilizer, dried manure etc. 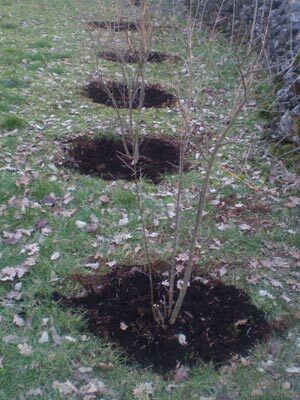 can be added in a single step, but, separate steps lead to more digging and more soil cleaning - very important, especially if you have fruit trees on the lawn patch. Late winter care - pomegranate tree line following old stone wall grown as decorative fence, but also for pomegranate fruits. Creating rings without grass and plants of any kind around pomegranate trees is very important, since such rings reduce competition for food and water. No matter how much one tries, wind will always deposit some old leaves on the lawn. When growing pomegranates in small garden, look at your plants and if needed, add some fertilizer if required, prune periodically or as required, water regularly if there is no rain etc. 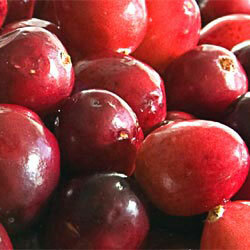 Pomegranate comes in many varieties, all of them having similar basic requirements. However, varieties differ, so if you are buying plants in local garden center or online, be sure to obtain plants that are suitable for your location and your needs - consuming fresh fruits, making pomegranate wine etc. Most of the people I know, have no idea which pomegranate varieties they have - some of them are found growing semi-wild, some of them are grown from the seeds they liked very much, some of them are grown from branch cuttings. Of course, there are also certified plants that do very well. Most common pomegranate varieties are Wonderful, Sweet Pomegranate, Parfianka, Kashmir Blend, Pink Satin, Sharp Velvet, Ambrosia, Angel Red etc. Before buying, check characteristics of individual variety and see if it suits your needs. Having non-invasive and relatively shallow root system, makes pomegranate trees suitable for growing in containers and flower pots. Large varieties of pomegranates can grow up to 6m (20 feet), however, there are varieties that grow 1-2m (3-7 feet) or even less in height.